Francis, Viscount Lovell and Sir Thomas Lovell are familiar names to those who are interested in English history at the end of the Middle Ages and the beginning of the Renaissance. Francis, Viscount Lovell is famous for being a close friend of Richard III. Sir Thomas Lovell is known as the chancellor and as an important advisor to Henry VII. The two men had the same surname, but they were not related. But can we be sure of that? "The surname Lovel, Luvel, Lovet (Lupellus - little wolf) was not uncommon in Norman times, and there is no likelihood that the families bearing it come from a common stock." Complete Peerage, viii, 199. As this quote from the Complete Peerage shows, there were a large number of families called Lovell in medieval England. There was, for example, a Lovell family who held Castle Cary in Somerset or another family who was named for their manor at Clevedon. Most of these families were not related, but there were, of course, Lovells who were members of the same family. The Lovells of Titchwell, for example, were a cadet branch of the Lovells of Titchmarsh. What then about Francis Lovell's family, the Lovells of Titchmarsh, and Thomas Lovell's family, the Lovells of Barton Bendish? Were they after all related, albeit distantly? It is an interesting question, though one that cannot really be answered with certainty. The first ancestor of the Lovells of Barton Bendish mentioned in The Visitations of Norfolk, Acelow Lovell, is said to be descendent of Sir William Lovell, knight, Count of Eu, who was slain in Normandy at the time of Henry I. A William Lovell was indeed an ancestor of the Lovells of Titchmarsh. He was the first to have held land in England, interestingly also in Norfolk, but he was no count of Eu. It is more likely that the compilers of the genealogy intended to enhance the status of their family by including a count of Eu as their illustrious ancestor, and several counts of Eu were indeed called William. According to the Visitations Thomas Lovell, "the first that did inhabit in Norfolk" married the daughter and coheiress of John Bendish of Barton Bendish and allegedly accompanied Richard I on his crusade. William Lovell's son, another William Lovell, was probably also a participant of this crusade. One can hypothesise that Thomas Lovell was a younger brother of this second William Lovell. If this was the case (and that is a big if) there is no evidence that the two families stayed in touch in any way. It was during the thirteenth century that heraldry fully developed. Though heraldic emblems had been employed before, it was around this time that their use became widespread and that the first regulations emerged. Coats of arms were recorded, studied, a heraldic language to describe them emerged, and, as important element of the identity of a family, they also became the object of quarrels between different families. The Lovells started to use the arms barry nebuly or and gules at the end of the thirteenth century. They were a variation of the Justiciar Philip Basset, barry undy or and gules, whose sister Katherine was married to John Lovell I (d. 1252). The arms of the Lovells of Barton Bendish are completely different, argent, a chevron azure, between three squirrels sejant, gules. As there were no firm rules about the use of heraldry yet, they were often adopted (as in the case of the Lovells of Titchmarsh) to show not only family connections but also links of alliance. The two very different coats of arms of the Lovells of Titchmarsh and the Lovells of Barton Bendish are strong indication that they did not consider themselves related or connected in any other way at this time. Not only are there no indications in the Visitations of Norfolk of any later familial connection between the two families, from the end of the thirteenth century, there are enough sources available about the Lovells of Titchmarsh to virtually rule out any later connection. If there every had been a any relationship at all, back in the twelfth century, by the time of Francis, Viscount Lovell and Sir Thomas Lovell it was so distant as to be completely irrelevant. Not only wealth separated them, geography did too. Francis Lovell spent most of the years after he came of age in the North in the orbit of Richard, duke of Gloucester, though he probably did not completely neglect his family's estates in the Midlands and Southern England. Thomas Lovell had studied at Lincoln's Inn in London and continued to work there during the 1470s and early 1480s and as a lawyer for clients in East Anglia. On two days we can be sure that Thomas Lovell and Francis Lovell were at the same place at the same time: on 22 August 1485 at the Battle of Bosworth and on 16 June 1487 at the Battle of Stoke. Both times they fought on opposite sides. In between those two days their roles reversed completely. In August 1485, Francis Lovell fought on the side of the reigning king and was one of the most important men in the realm. Thomas Lovell was a convicted traitor (still? or had he been pardoned? no idea) throwing in his lot with a pretender from overseas. By June 1487, Francis Lovell had been a fugitive for almost two years, and Thomas Lovell had become one of the closest and most important advisors of the new king. This time it was Francis Lovell who fought for a pretender, and one he must have known (by all evidence) to be an impostor. Just as Francis Lovell had become a major player at court when Richard III had taken the crown, Thomas Lovell emerged after the Battle of Bosworth immediately as one of the most important figures under the new king. Thomas Lovell was speaker of the Commons in the first parliament of Henry VII, in which Francis Lovell was attainted and his estates declared forfeit to the crown. 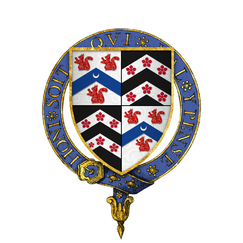 The lands were parcelled out among Henry VII's supporters, and among those who benefited was also Thomas Lovell who received the lordship of Didlington (Oxfordshire). Thomas Lovell's importance and the reliance Henry VII placed on him can be seen when Thomas Lovell was together with Reynold Bray put in charge of the delicate mission of the construction of Richard III's tomb in Leicester. Thomas Lovell in fact became a picture-book evil henchmen of Henry VII, doing the king's dirty work. 'Strange things tended to happen when Lovell was around' as Thomas Penn put it. He was lieutenant commander of the Tower, when the Earl of Warwick and Perkin Warbeck tried to escape and he personally arrested James Tyrell, who later famously confessed to having killed the Princes in the Tower. Francis Lovell vanished after the Battle of Stoke at the age of about 32. Thomas Lovell lived to the grand old age of about 75. Though both were married, neither had any children. Francis Lovell's lands were forfeited to the crown, while Thomas Lovell determined the disposition of the substantial wealth he had amassed. He arranged good marriages for his nieces and passed the bulk of his lands to his nephew, another Francis Lovell (of East Harling). Francis, Viscount Lovell and Sir Thomas Lovell may never have met in person, but their lives intersected at several points. Despite their different families, their different social status, and their choosing different sides in this last stage of the Wars of the Roses, the had one thing in common: their close service to their king. Both were rewarded for this service by election to the most prestigious knightly order, the Order of the Garter. They also were both remarkably tenacious in their loyalty to their kings. Francis Lovell utterly refused to accept Henry VII as the new king and fought for a lost cause to the bitter end. Thomas Lovell did everything in his power, no matter how unsavoury, to ensure the stability of Henry VII's government. William Collingbourne called Francis Lovell 'Lovell the dog', a pun on the crest of his coat of arms, which in turn illustrates the origin of the surname Lovell. The dog is famed for being a most faithful friend, and, each in his own way, both Francis Lovell and Thomas Lovell displayed this sort of loyalty to their kings. Just to illustrate this point: nine different Lovells can be found on the muster rolls for Henry V's campaign to France in 1415, and this number does not include Robert Lovell, the younger son of John Lovell VII, who very probably went on this campaign as well. Walter Rye (ed. ), 'The Visitations of Norfolk, 1563, 1589, and 1613' Harlaien Society 31 (1891), p. 190. Thomas Penn, Winter King. The Dawn of Tudor England (London, 2012), p. 82. S. J. Gunn, Sir Thomas Lovell (c.1449–1524), Oxford Dictionary of National Biography. 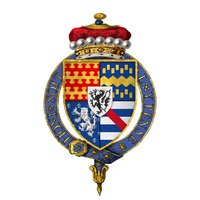 - 'Sir Thomas Lovell (c. 1449-1524), A New Man in a New Monarchy? ', in J.L. Watts, The End of the Middle Ages? England in the Fifteenth and Sixteenth Centuries (Thrupp, Stroud, 1998), 117-133. Monika E. Simon, 'The Lovells of Titchmarsh. A Late Medieval Baronial Family (1297-148? )', (unpubl. DPhil Thesis, University of York, 1999).